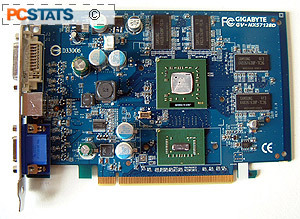 Abstract: The Gigabyte GV-NX57128D video card is a PCI Express x16 solution that is based on the GeForcePCX 5750 GPU. While the Gigabyte GV-NX57128D can handle UT2003 pretty well without AA and or AF enabled, the same can't be said when all the eye candy is turned on at the maximum level. I suppose a lot of consumers were under the impression that the PCI-Express x6 slot would bring about unbridled leaps in video card performance because of its large 8GB/s bandwidth. Well, that may be true, but as ATI and nVidia are providing AGP-based GPUs, we are still left waiting for the true first generation PCI-Express video card to really show us what it is capable of. And it would also help the industry to have a killer application which could actually push PCI-Express to its limits. For the moment, gamers are left wanting on both fronts, but this being the computer industry, I'm sure the that will be changing quickly. In our first look at a PCI-Express video card, you may be coming away a little disappointed. Hence it is important to remember that the Gigabyte GV-NX57128D is a PCX 5750 based video card. This GPU is a mainstream solution, and it is intended to satisfy mainstream gaming demands. There are high end PCI-E based video cards on their way, but expect them to roll out at a leisurely pace. The demand for AGP cards is still quite strong, and both nVidia and ATI are sure not to let market share slip by them when the right time comes. With 128MB of DDR memory, the Gigabyte GV-NX57128D is a capable mainstream card which is really best suited for average consumers who gamer moderately. I wouldn't suggest running this card at 1600x1200 for anything more than desktop applications, as the frame rates in most of the benchmarks were low. With a retail price of $175 CDN ($133 US), you really can't expect the card to go toe to toe with a Radeon 9800XT or GeForceFX 5950 Ultra, but its gaming performance at 1024x768 was pretty good, and as an overclocker it has a little extra power just waiting to be tapped.